With their primary members dwindling, there is a looming question: Is Judas Priests’ new album, Firepower, classic Priest? Guitarist K.K. Downing is no longer with the band, and guitarist Glen Tipton is battling Parkinson’s disease and bowing out for the upcoming tour, with co-producer Andy Sneap filling in. Downing and Tipton were very much a dual threat on guitars, creating the classic Priest sound on albums like Defenders of the Faith, Screaming for Vengeance and Painkiller. Rob Halford and Ian Hill remain from the band’s original lineup. The controversy of absent band members and the change of album sounds is nothing new. A prime example is when Jason Newstead stepped up for And Justice for All after Cliff Burton’s passing. It’s forever cemented that Newstead’s bass sound is barely heard on the album. With all this in mind as I went in to listen to Firepower, I took note that a band in its heyday is nothing compared to a band in their so called “twilight years,” but that doesn’t mean a new album has to instantly be bad or automatically judged as bad because of lack of members, age or time passed since the glory days. 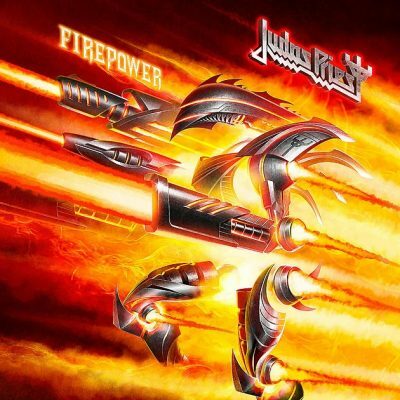 Firepower starts out with its title track blazing some hefty, chunky guitar riffing—not exactly in the realm of classic Priest, but it leads the track into its catchy, already anthem-like quality. The follow-up, “Lightning Strike,” definitely sounds more in the vein of classic Priest. As I progress forward through the album, I do notice its stark differences in production and guitar tones. It’s nothing so glaring: There are some truly great riffs going on and a ton of catchy songs. The worst offense in the entire sound of the album is that the guitar solos—every single one—are stale as a two-week-old bagel. They try to have soul, but it just feels like a guitar aficionado more concerned with technicality than substance. The first half of the record is filled with catchy, fist-pumping tracks. The first six songs have already dug their metal teeth into my skull, unlike the rather tedious last album, Redeemer of Souls, of which the only song I can name is the title track. After those first six cuts on Firepower—highlights being “Necromancer” and “Never the Heroes”—things get a little muddy. “Rising from the Ruins” enters ballad territory, which is fine, but it doesn’t have the soul of those initial songs. “Flame Thrower” does have some of that ’80s-style cheese lyrically and musically, but the core riff is pretty derivative. “Traitors Gate” is the strongest track of the latter half of the album. Halford’s vocal approach is pretty vicious and fun to hear. The album’s 14 tracks could have easily been trimmed to 11, maybe 12.